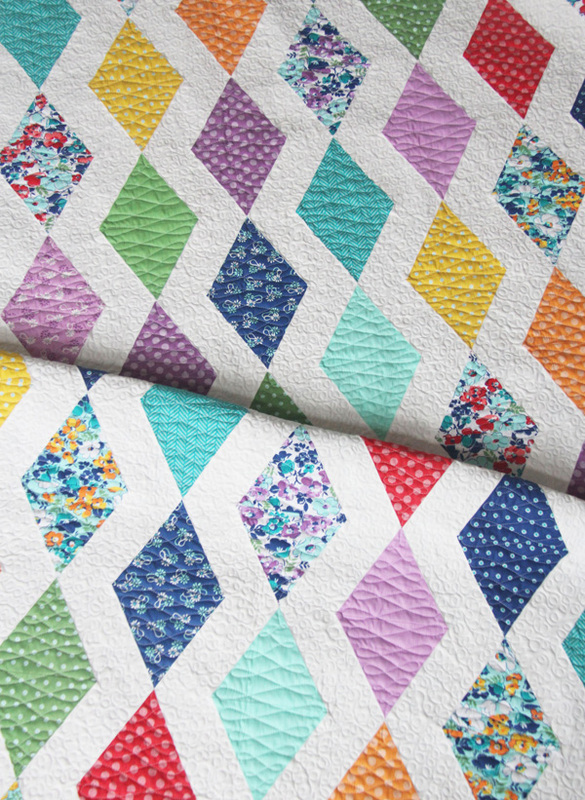 I should probably share these quilts in the order they were made…but instead I’m sharing my favorite first! 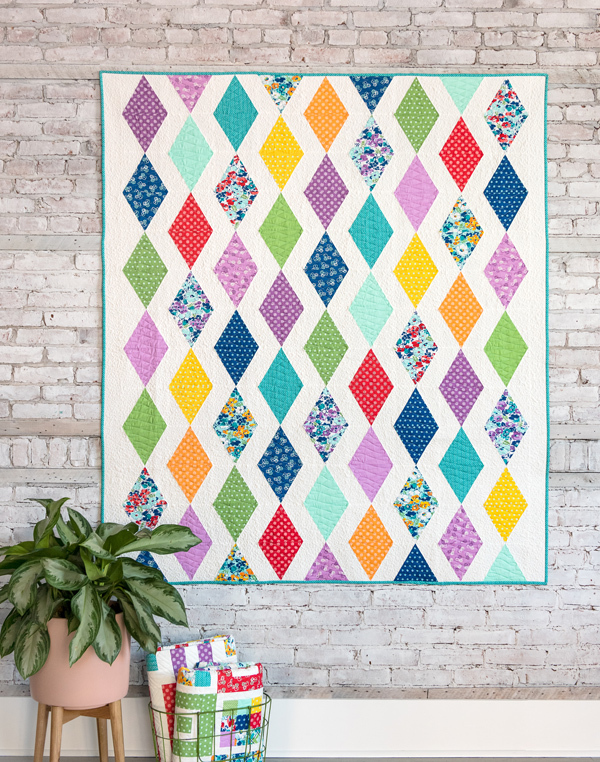 Cascade is a twist on a diamond quilt pattern but made with triangles. The pattern calls for a 60 degree triangle ruler and fat quarters, and comes in two sizes, a crib with smaller blocks, and the throw with larger blocks. I called this an intermediate level pattern because the units have to be lined up just so and you have to make sure to use a perfect 1/4″ seam allowances. Other than that it goes together smoothly and I included pictures in the pattern to make it easy. This is a great one for chain piecing! Kathy quilted this one for me (above). Isn’t it beautiful?! She does all her quilting free hand and I’m always amazed she can stay so steady and precise! The crib size below was obviously quilted by me LOL. Not as pretty or precise but it does the job! The purples and blues are my favorite combo in this fabric. More info on this quilt can be found in the listing here (or paper version here). Love the fabric and the Cascade pattern! Can’t wait to make it…it’s adorable! It comes out in May! Thank you Helen! I just would like to say I liked your quilting the most, love the way it accented the pattern! Love the blue and purples of the new fabric line! Just add a few greens and I’m all set (ocean colors get me every time) And sweetie girl Jane?! Love her ruffled bum pants! Little girls have all the cute clothes to sew, my 7 year old son just wants PJ pants lol. Thank you….as long as you don’t look too close it looks OK and hopefully it will be used anyways right? Thanks for visiting! Great pattern! I hate that bobbin thing. The machine should beep at you when that happens! Just curious, to get accurate quarter inch seams, does the way you press your seams have any bearing on that? I love both the fabric and the pattern! Perfect! Beautiful – love that diamond pattern! Also love your shortcake pattern – love the patchwork blocks in between the log cabin type blocks. Your new fabric line is really special!! Oh I feel your pain on the bobbin thread thing! Hate it when that happens!! The baby and the fabric are beautiful!!! I love the cascade pattern. the quilting on both is beautiful, although I am a straight line quilter. Love those straight lines. 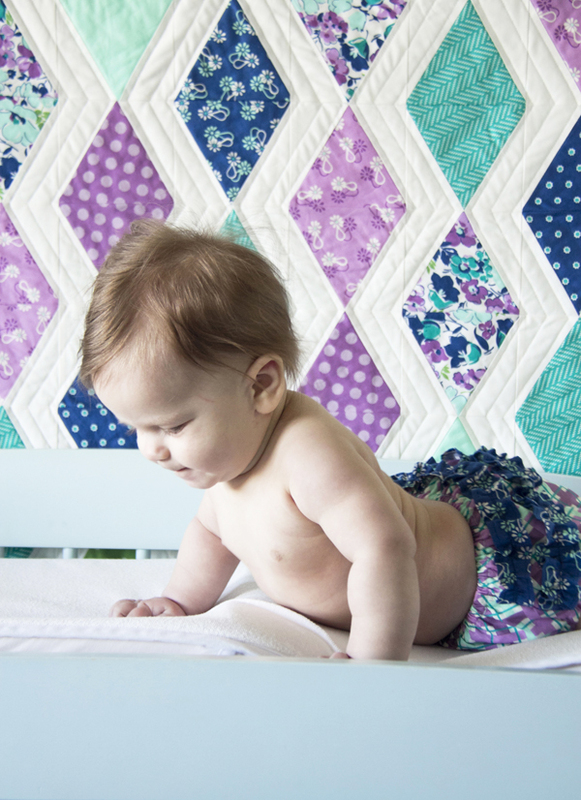 OK – Miss Jane’s ruffle bum pants are so dang cute in her fabrics! 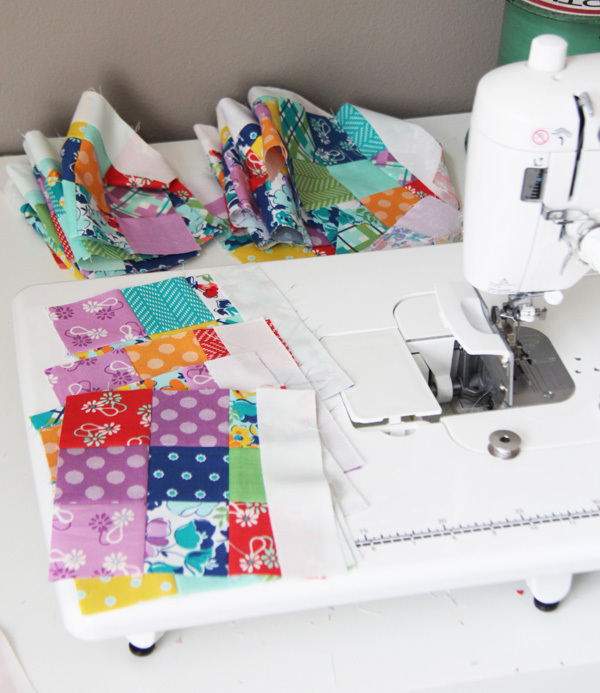 I love both quilts – I don’t have one inch of purple fabric in my stash….your prints are so pretty – I’ll have to start adding purples! Your little Jane is sooooo adorable and I love her hair! One of our great granddaughters had wild and crazy hair, but her’s was curly! The 2 of them together would have made a great advertisement for today’s hair tamers. lol Fortunately my machine beeps at me when I’m getting low on bobbin thread, or else I’d be in the same predicament you were. Love your diamond quilt!! Personally I like simple quilting. The condensed style is too much for me. I love this quilt and the pattern is great. I have never gone that far on blocks chain sewing without bobbin thread :-D 😀😀😀 so sorry for that, however I have indeed done borders, unpinned and careful observance of seams, back stitched and pulled it off of the machine…. ooops. Most of the time all of my mechanical machines do give a bit of a rattly sound when the thread is almost low. I love the purple and blue combo Allison (and I am not a purple girl)! My love affair with your designs continues😍 I can’t wait for Hello Jane to be available in Australia! Thank you Deb!!! Have a great day!! 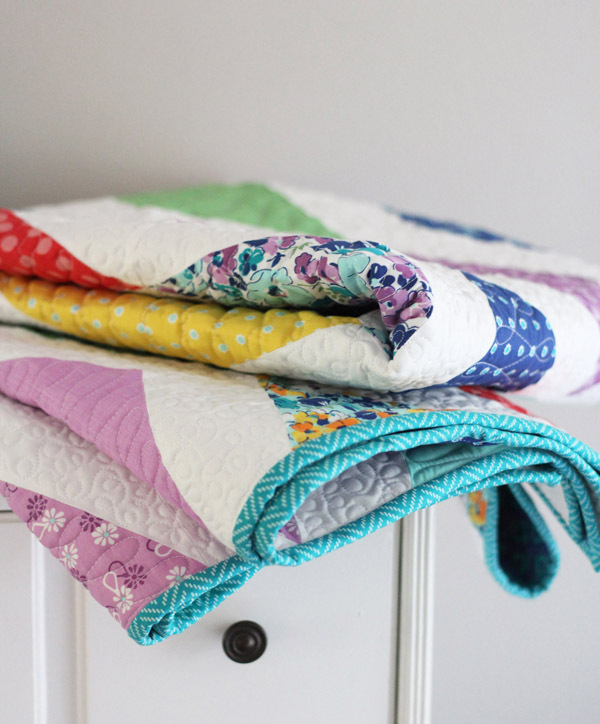 What white fabric did you use in these quilts? I use Moda Bella Solid in number 9900-97 (I think it’s the bleached white). Do you have a favorite solid white fabric?